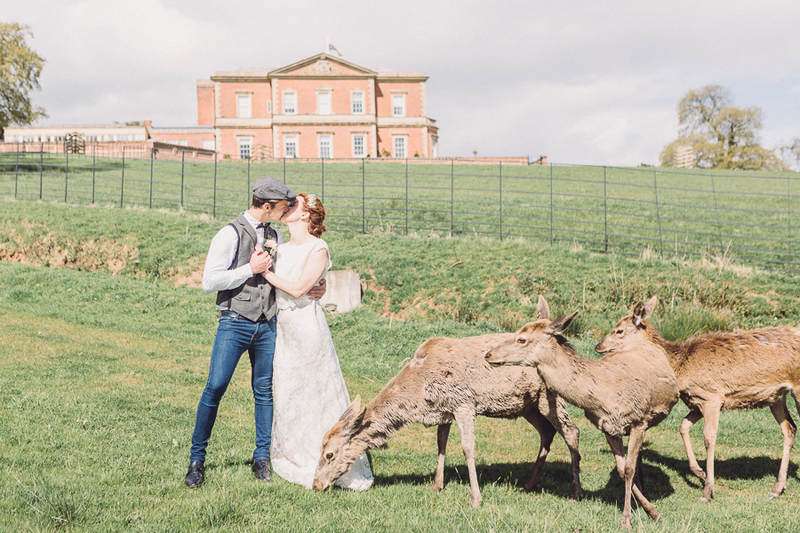 Kate and Scott’s wedding at Somerford Hall was a real family affair, with everyone helping create a beautiful and personal celebration for this gorgeous couple. I loved reading about it on their photographer Andrew Ward‘s blog and couldn’t resist sharing their big day with you all on the English Wedding Blog. Somerford Hall is an 18th century mansion house in Staffordshire, with the most beautiful landscaped gardens and spectacular scenery. Kate told me it didn’t need very much decoration at all – naturally – and so everyone’s creative efforts were focused on table decorations, favours and even the wedding cake which Kate’s dad made from start to finish! Kate’s dress is Constantine by Ian Stuart – and she wears it beautifully. Scott and the rest of the guys wear yellow buttonholes and socks which tie in with the theme of the day – a lovely sunny yellow. Just the perfect wedding to grace our screens on this chilly October day, I think! A day full of love, laughter and special touches. We absolutely loved our photos. They captured the day perfectly. Andrew was 100% professional and made us and our guests feel at ease throughout the day. Do as much as you feel comfortable with yourself. We made most things ourselves, from the save the dates through to the table centrepieces and even the bouquet. It certainly helped the purse strings! We made the invites with a bit of help from mom’s craft box and a lot of patience! YES!! Absolutely. I first tried on ‘the’ dress just a couple of months into our engagement at the National Wedding fair at the NEC. After a sneaky peek at the price tag, I swiftly put it back, only to gaze at the photos for the next 12 months until we visited Margot Raybould at Beatties, Wolverhampton, and the dream became reality! Ian Stuart (Constantine). My accessories were low key with some handmade elements again with the cuff bracelet. I wore my nan’s pearl stud earrings and Scott bought me a pearl bracelet which complimented them perfectly. Three piece grey suit from Moss with a spotty yellow tie and coordinating yellow socks! Chief bridesmaid Charlotte wore a lace cream dress from H&M and the flower girls had a pretty frilly cream dress from Monsoon. Got to be DIY! I love doing my own makeup and probably wouldn’t trust anyone else! It gave me an excuse to browse the makeup counter at MAC for hours on end and become very familiar with YouTube tutorials! You guessed it… DIY again. We knew fairly early on that we didn’t want to spend hundreds of pound on flowers, so after finding lots of inspiration on Pinterest, my mom set to work on my bouquet and Scott and I focused on the venue decoration. 1 Corinthians 13, read by chief bridesmaid Charlotte and Wedding poem read by usher and nephew Ben. Both the church and Somerford Hall were beautiful venues and needed very little decoration. The cake was modern with three tiers of sponge and fruit cake. My dad did a brilliant job of making and icing the cake and we had lots of compliments from the guests on the taste too! We had a DJ in the evening which ensured everyone could have a boogie and there was music to suit everyone. Take time to just stand back and take it all in. Everyone at your wedding is there to celebrate the best day of your lives, so don’t sweat the small stuff and enjoy it!